This healthy and quick summer meal happened last weekend after pressure-cooking a pot of black beans to stock my freezer. 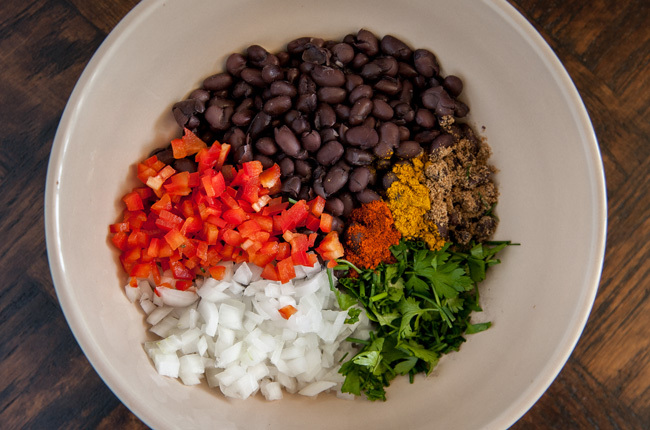 Black beans are the standard legume in my house; we eat them alllll the time, mostly in Mexican and Cuban-style dishes. But as I scooped the magical fruits into plastic bags flattened for efficient storage, lacking any dinner plans, I decided to set a bowl aside to get out of the rut and try something different. I’ve been in the mood for Mediterranean food lately, and it’s been forever since I’ve had a good falafel, which in my house we refer to as “crunch patties” in honor of the classic episode of The Simpsons. 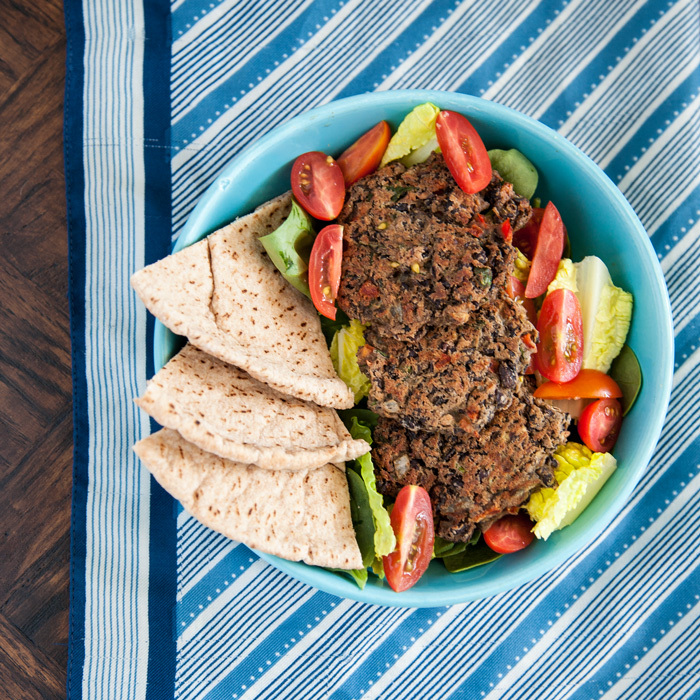 And they’re perfect for light summer dining, so why not mix things up with some black beans? Since my choice of bean already broke with conventional falafel notions, I didn’t want to tie myself down to traditional spices. I hit up the herb garden, opened my spice cabinet, and went crazy with some of my favorite ways to compliment black beans. The result was a mixture of cilantro + parsley + chives + curry + coriander + cayenne and it was a winning combination. This could come together super effortlessly in a food processor, but since I don’t have one I can tell you that it’s totally easy to mash together by hand too. And honestly, I was a little concerned that this baked bean mush wouldn’t brown properly in the oven, but these absolutely lived up to our crunch patty expectations – so crisp! Serve them on their own, tucked into a pita, or my choice for the night: on top of a fresh salad. Whichever vehicle you choose, don’t forget to load up on your favorite “flavor sauce”! I usually love a refreshing yogurt-based tzatziki, but for this dinner I took a shortcut and topped my bowl with Trader Joe’s creamy Greek Style Feta Dressing. It gets my RD seal of approval! Respectable ingredients and very tasty. So, how’s your easy summer dinner game going? Preheat oven to 400 F and coat a sheet pan with the olive oil. Combine all other ingredients in a medium bowl and blend with a potato masher until cohesive, but still chunky. 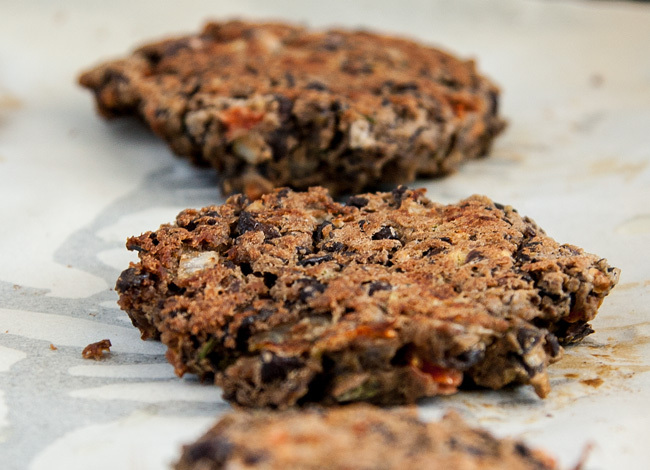 Form the mixture into 8 equally-sized patties and arrange on the oiled baking sheet. Bake the patties for 25-30 minutes, flipping halfway through, until crisp and golden brown. Previous Previous post: What’s the Deal with Seedless Watermelon?